Can someone serve the needs of others with total sincerity and commitment without having an adult intimate relationship of her (or his) own? The Catholic Church would say it expects that of its nuns and priests all the time. Other denominations find this quite daunting. In “Raw Faith” (2010, directed by William Peter Wiedensmith), a Unitarian pastor in Portland OR shares her life and feelings with us as she prepares to leave the ministry after seventeen years, because she has fallen in love. The pastor is Marilyn Sewell, and the church is the First Unitarian. The church, back in 1992, had set up a “no hate zone” to oppose the anti-gay initiative known as Measure 9, which did not pass. The language of the measure was horrifying and is explained in Wikipedia (website url) here. I recall that former midshipman Joseph Steffan went out there to assist in defeating it, after his booksigning for "Honor Bound". But let’s get back to the film. For much of its length, Sewell is making a video diary, where she speaks into the camera, projecting a reduced image on the movie screen. She used to keep it by hand, but it’s not clear that she had put it online as a blog. She describes her early life, including he being taken from her own mother by her father, and then an earlier divorce with small children. She felt she wasn’t naturally inclined for motherhood. But she says she felt a calling to minister and is serving a purpose higher than herself. She also gives an interesting piece of logic about how she wants there to be a god but doesn’t know there is one. 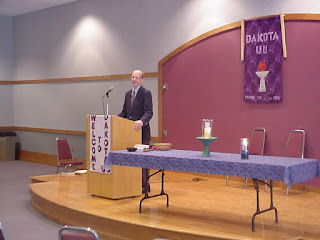 When I lived in Minneapolis (1997-2003) I sometimes attended the Dakota Unitarian Fellowship, and spoke there in 2002 after 9/11 (in Rosemount). Marilyn Sewell’s site (for the film, from Kino Lorber) is here.